This will be a (relatively) short post, but I think it’s an important part of the Johannesburg post that I will be publishing next. I left for South Africa in January 2017 and everyone I mentioned the trip to was so excited for my plans… until I mentioned that I would be spending the majority of my two-month trip in Johannesburg. Then people started to get worried. The question: Is Johannesburg safe? The answer: In the long and short: YES! For me, safety in Johannesburg is more about common sense that anything else. ALL cities are dangerous. I’ve had friends mugged in Paris, Rome, London, anywhere can be dangerous if you’re not being sensible and Joburg is no different. The below tips are common sense for cities all over the world, especially as a solo traveller. But I’ll write them here in the context of good old Joburg. 2) UBER! South Africa was my first time consistently using uber and it was amazing. You can link it to your card or pay cash, book one from anywhere with wifi and rest easy knowing you have the drivers details and they are fully accountable for the journey. Uber in South Africa is really the closest thing they have to what we know as “taxis” in the rest of the world (in SA taxis are something completely different and not super recommended for tourists) so don’t land in Joburg without the app downloaded. 3) Study a map, and know your neighbourhoods. 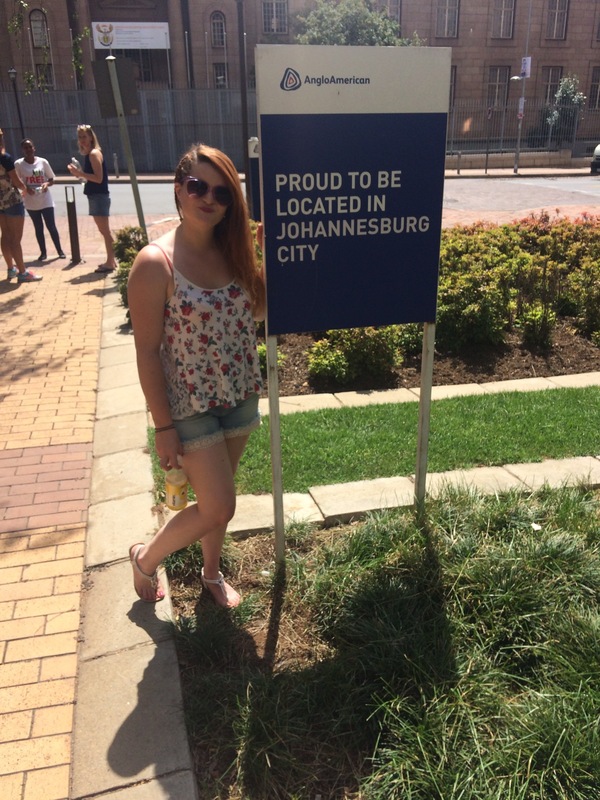 I lived in Braamfontein, a busy and relatively safe student area. But just over the hill? Hillbrow, not an area I particularly wanted to end up in as a tourist. 4) Wear a money belt under your clothes. Yes, I know they’re embarrassing and touristy but honestly it’s a lot less tempting for a would-be mugger if they can’t even see your valuables. And actually it was nice for me to not be carrying around a Mary Poppins style gigantic handbag containing everything but the kitchen sink as I normally do. 1) Don’t take your phone out with you! (unless a. you need it to order an Uber or b. you don’t mind it getting stolen). Phones are the number 1 thing muggers want and they’re a huge hassle for us to replace. If you do need it for ordering an uber then keep it in the aforementioned money belt and take it out ONLY when safe inside a museum/cafe etc and only for the time you need to actually do the ordering. 3) Don’t wear flashy jewellery. It’s just attracting unnecessary attention and to be honest you shouldn’t really be bringing fancy jewellery with you anywhere you travel, even if you don’t get mugged the chance of losing it is too high! 4) Don’t look like a tourist. Try to walk places with confidence and learn the local area with a map BEFORE you leave your accommodation to avoid walking around with the map glued to your nose. And that’s pretty much it. Common sense goes a long way in this fascinating city and misconceptions and fear based on historical prejudices and misinformation should not keep you from visiting! I might consider traveling to South Africa by myself and this post was really helpful! I’ve solo traveled to Barcelona so I think I could handle traveling by myself in South Africa!